Signs of Cycling Puzzle is the perfect gift for your cycling buddies and your puzzle geeky friends! This collage is full of the ubiquitous signs you see while cycling as well as some very unique warnings (volcanoes?!!). 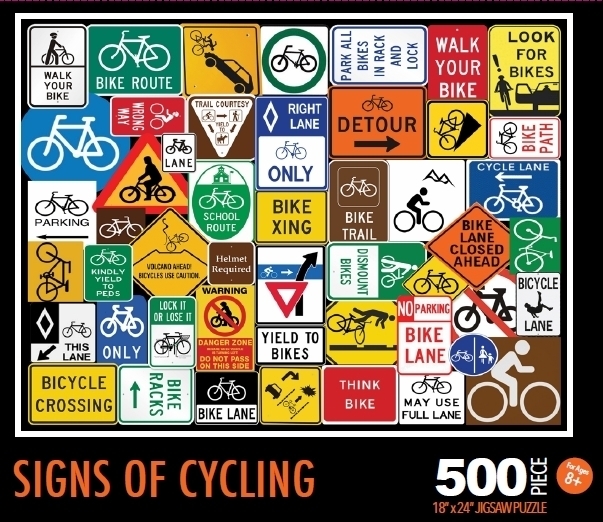 The idea of this collage of bicycle signs was conceived on our recent trip to Whistler, Canada, where we saw a sign on the side of a mountain pass of a cyclist falling off a cliff. We laughed at this alarming sign which left very little to the imagination and we decided to start collecting images of municipal bicycle signs from all over the U.S. This jigsaw puzzle has 500 pieces, and each piece is individually cut (every piece is a different size!). The puzzle is challenging, yet fun! 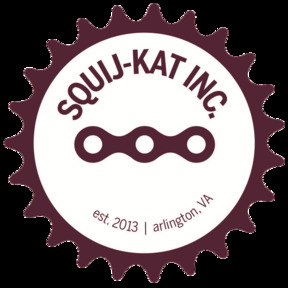 Great for cycling and puzzle enthusiasts alike!